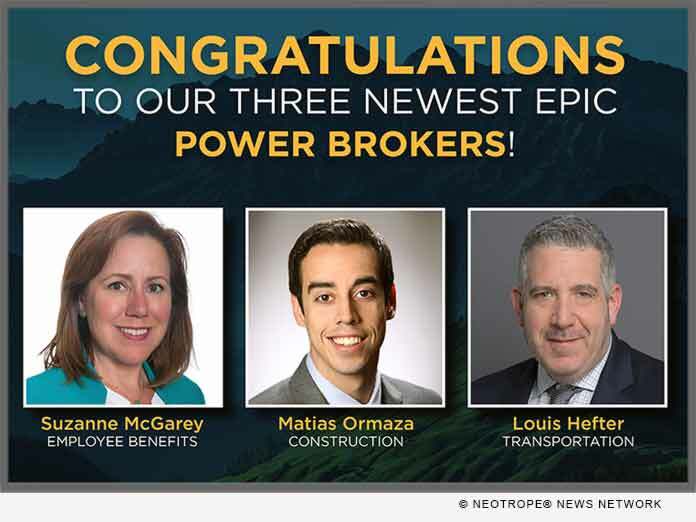 SAN FRANCISCO, Calif. /California Newswire/ — EPIC Insurance Brokers and Consultants, a retail property, casualty insurance brokerage and employee benefits consultant, announced today that Managing Principal Suzanne McGarey and Senior Vice President Matias Ormaza have been recognized as 2018 Power Brokers by Risk & Insurance Magazine. Principal Louis Hefter was named a finalist. Managing Principal Suzanne McGarey was selected in the Employee Benefits category for her work helping clients develop effective benefits strategies. She helped a private equity firm revamp its benefits offerings to recruit the best of the best by conducting a survey of employees to determine what benefits are found most valuable. Senior Vice President Matias Ormaza was selected in the Construction category for his work in supporting a client’s conversion from a public company to private, a credit facility refinancing and a large acquisition, in which the client credited Ormaza for years of work that culminated in these accomplishments. Ormaza made recommendations to another client that saved them over $1 million in premium this year. Principal Louis Hefter was named a finalist in the Transportation category for his work in alternative risk insurance programs. Suzanne McGarey joined Ascende – A Division of EPIC in 2001. Today her primary focus is on the firm’s delivery of health and welfare consulting and business analytic services. She also provides oversight and integration of services for the company’s additional consulting practices. She guides the practice leaders and managing consultants in developing cohesive strategies to advance our clients’ business objectives. In addition, she meets with industry leaders and participates on executive advisory councils for the major health insurance carriers to engage in developing trends and represent the issues our clients face. Her experience at Ascende includes managing the design, funding, administration and communication of employer-sponsored health and welfare plans. She provides expertise on the technical requirements, financial impacts and administrative mandates associated with the Affordable Care Act, as well as its wide-ranging effects on the industry. Matias Ormaza is a Senior Vice President with Greyling Insurance – a Division of EPIC. In his role, he negotiates and places coverage for large design firms and design-builders. He works closely with clients who have global exposures and revenue ranging from $25 million to more than $1 billion. He is experienced in the unique coverage needs of design firms and has negotiated a wide range of large and complex project-specific policies for professional liability, pollution liability and builders risk programs. Ormaza joined Greyling in 2007. Prior to that, he was an administrative manager of underwriting with Insurance Specialists, Inc., where he focused on lawyers professional liability insurance. He was a professional tennis player on the Association of Tennis Professionals (ATP) tour from 1999 through 2001. Ormaza holds the Construction Risk and Insurance Specialist (CRIS) professional designation. Ormaza earned his degree from University of Georgia, where he majored in risk management and insurance with an emphasis on finance. He is originally from Argentina and is fluent in Spanish. Louis Hefter has been insuring Moving & Storage, Final Mile Home Delivery and Warehousing/Logistics companies for approximately 20 years. Since joining The Capacity Group – an EPIC Company, Hefter has been instrumental in launching several alternative risk insurance programs. With a strong background and expertise in the industry, Hefter has been published numerous times addressing risk and liability for moving and storage companies. A Risk & Insurance(r) Power Broker(r) is an individual who stands out among their peers for the exceptional client work they delivered over the past year. While brokers play many key roles in the insurance industry and risk profession, a Power Broker(r) award recognizes problem solving, customer service and industry knowledge.